Secretary of the Interior Ryan Zinke responded to a Democratic congressman's call for him to resign by suggesting the lawmaker has poor judgement steaming from alleged bad drinking habits. In a USA Today op-ed released earlier Friday, Rep. Raul Grijalva (D., Ariz.) said Zinke should step down as secretary. "It's hard for him to think straight from the bottom of the bottle. This is coming from a man who used nearly $50,000 in tax dollars as hush money to cover up his drunken and hostile behavior. He should resign and pay back the taxpayer for the hush money and the tens of thousands of dollars he forced my department to spend investigating unfounded allegations," Zinke stated. The hashtag #TuneInnForMore refers to a bar near the Capitol. In his op-ed, Grijalva claimed Zinke "has never even tried to offer an explanation for the sheer scope of his well-documented scandals." 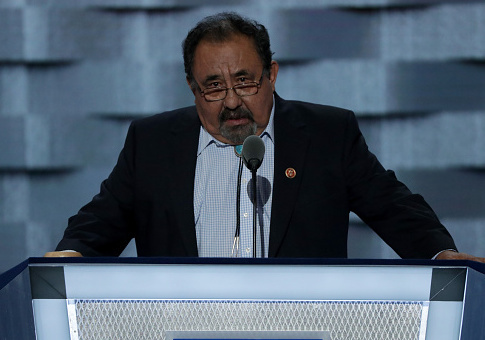 "Ryan Zinke needs to resign immediately as Secretary of the Interior," Grijalva argued. Grijalva is currently the ranking member on the House Natural Resources committee, which oversees the Interior Department, and will likely head the committee once the next session of Congress starts with Democrats in control. As ranking member, Grijalva has looked into allegations that Zinke illegally entered into a real estate deal with Halliburton's chairman. "The least he can do is step down and give his successor a chance to begin reversing that damage," Grijalva continued. Last year, Grijalva called for the Washington Times to apologize after it reported his office paid a $48,000 severance package to an employee. The Times reported an employee threatened to sue in 2015, alleging a hostile work environment and accusing Grijalva of frequent drunkenness, but his office ended up paying her salary for five more months as a settlement. Grijalva did not deny the reported details of the severance package. This entry was posted in Politics and tagged Raul Grijalva, Ryan Zinke. Bookmark the permalink.